Survivor or Loser. They are basically the same type of logic, making a correct pick based on one pick per week. Double Weeks We do offer the option of setting up some double weeks where players must make two picks for the week. Single, Double, Triple or more knockout settings. This allows you to keep people in the game longer if you wish. Of course you can stick to the traditional Single knockout, and people are gone after one bad pick. Delayed Start - this allows you to begin your survivor/loser pool in week 2, 3 or 10. Whatever week fits your schedule can be the start week of your contest. 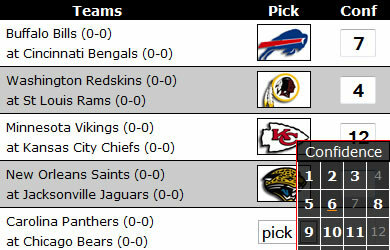 Rankings based on picks correct, or points earned through margin of victory among other options. Team Value System. This is where you setup values for each team. When players are correct when picking that team, they earn the preset value of points you have set for that team. Typically you would put low values on high powered teams, and high values on teams that are weak. That way, it`s tough to predict when that Doormat of the league will get a win, but when you do, wow do the points come through for you. High Score You basically pick a team each week, and the points they score are the points you get. Your goal is to score the most points. You can control how many times a player can pick any given team. Low Score This is the opposite of course of the HighScore game. Your aim is to accumulate as few points as possible throughout the season.